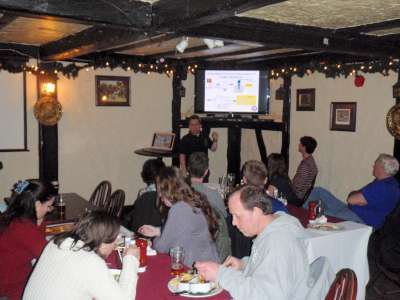 On January 31, 2012, Laurentian SETAC hosted Dr. Michael Wilkie from Wilfrid Laurier University at Shakespeare’s Arms (or Shakie’s, as we like to call it) for our near-monthly Pub Night. Dr. Wilkie gave a very informative presentation entitled “The metabolic economics of lampricide toxicity in sea lamprey and non-target fishes: a question of supply and demand”, on the mechanisms of toxicity of 3-trifluoromethyl-4-nitrophenol (TFM) on fish populations in the Great Lakes tributaries. TFM is a lampricide used to control the sea lamprey populations in the Great Lakes. Dr. Wilkie briefly described the life cycle of the sea lampreys, which spend most of their life buried in the sand of rivers and streams, as filter-feeders. Upon reaching an appropriate size, the lampreys undergo metamorphosis, preparing them for the parasitic life stage that follows. They subsequently migrate to the Great Lakes, where they feed by attaching themselves to the sides of larger, economically important fishes, such as brown trout and rainbow trout, usually leading to the eventual death of the host fish. Lamprey invasion of the Great Lakes, in addition to overfishing, has been correlated with a decrease in fish populations. 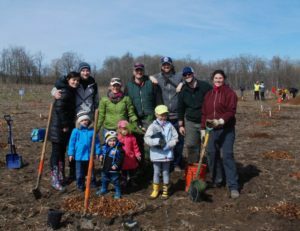 The Great Lakes Fisheries Commission was created as a partnership between Canada and the United States, one of its main goals being to attempt to eradicate, and later control, the sea lamprey populations. Therefore, TFM has been used for over 50 years as a lampricide, and, until recently, scientists have only been able to speculate on how it exerts its toxicity on the sea lamprey, with minimal effects on non-target fish species. Dr. Wilkie’s research has been able to shed light on this little-known fact. By using isolated mitochondria from fish livers, his group has demonstrated that TFM exerts its toxicity by uncoupling mitochondrial oxidative phosphorylation in sea lamprey and rainbow trout, a fish representative of the non-target fish species. Dr. Wilkie’s group determined that, in vivo, the trout are more resistant than the lampreys to TFM because they have UDP-glucuronosyl transferases, which are enzymes capable of detoxifying chemicals such as TFM. Sea lampreys do not possess high concentrations of these enzymes and, therefore, are more sensitive to this chemical. In addition to determining the mode of toxicity of TFM, Dr. Wilkie’s research also showed that sea lampreys recover after 6 hours of exposure to TFM, suggesting that if the regular 12-h TFM stream treatments are cut short due to weather conditions, they may not be as effective as it was initially believed. 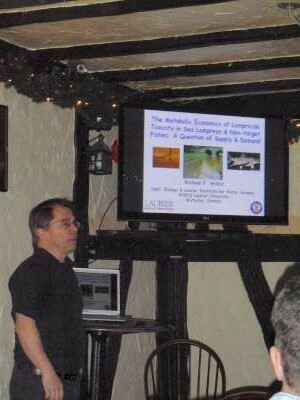 Lastly, Dr. Wilkie suggested that the increase in sensitivity of lamprey to TFM that has been reported by the Sea Lamprey Control personnel in early spring miay be related to the fishes’ low fuel reserves, as the animals emerge from their over-wintering period, when food is scarce in the streams. Overall, Dr. Wilkie’s presentation introduced us to a detailed in vitro approach to determining the mode of toxicity of chemicals, and particularly pesticides, that are extensively used in our daily lives, and it provided a more in-depth knowledge of how fish physiology is affected by chemicals.